For the celebration of an extraordinary concert to be performed by the Orquesta Ciudad de Granada, the initial proposal featured an opera gala based on arias by Verdi and Puccini, with guest appearances by various singers. After giving a whirl to the common Traviatas, Rigolettos and Toscas, I felt this programme had been presented on too many occasions. 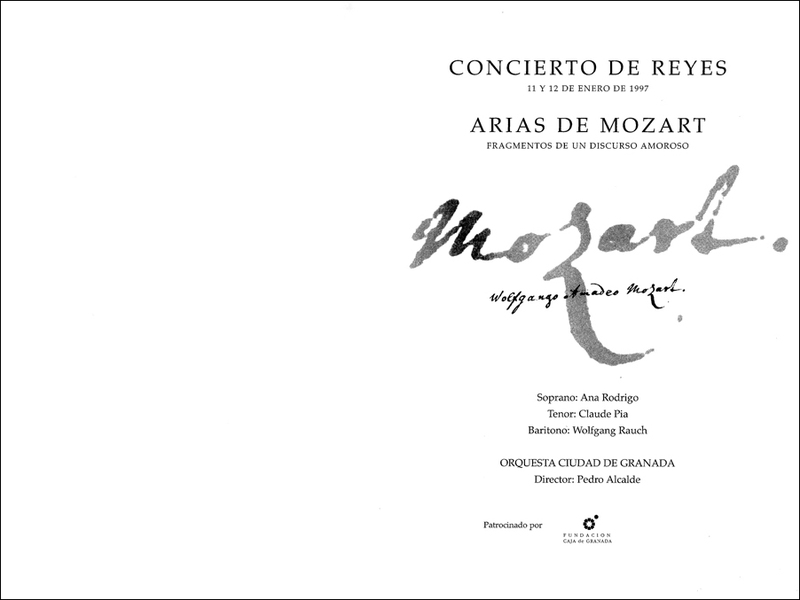 The counterproposal was two-fold: On the one hand to use Mozart and on the other, to gather the arias of the concert under a common denominator. The idea to bring together the different cuts of the original operatic discourse to form a new collection was inspired by a book that I was reading almost by chance at that time: Lover’s Discourse: Fragments by Roland Barthes. The solution that the book presented was also two-fold: firstly to place the various fragments of the amorous discourse into a manner of boxes to be called “figures”, and secondly that the said figures were not to reach a conclusion, nor start nor finish and that any order, even a random one, was inconsequential. The next step was to select the arias in view of their possible congruence with one of the figures of the discourse and sort them according to musical criteria alone. The result on paper was a peculiar catalogue: “Dependency, Don Juan, Memories, Portrait, Love, Death, Desire, Gaze, Perseverance, Heart, Seduction, Vendetta, Scene.” All that remained was to draw up a programme for the printed handbill that, by means of its structure and content, would act as an explanation and a complement to the concert. Not until the final chord sounded on the day of the presentation did I stop tormenting myself as to whether what looked good on paper as a programme could hold its own as a concert or even as an opera gala. The warm reception by the audience confirmed that on this occasion, the difficult dialectic between concert and programme had been overcome.